2. Combine in a large sauce pan on medium heat: sugar, butter, and evaporated milk. Heat to a rolling boil while stirring constantly. Continue to boil and stir for 3 min, then remove from heat. 3. Immediately stir in: white chocolate, marshmallow fluff, vanilla, and crushed Oreos. 5. 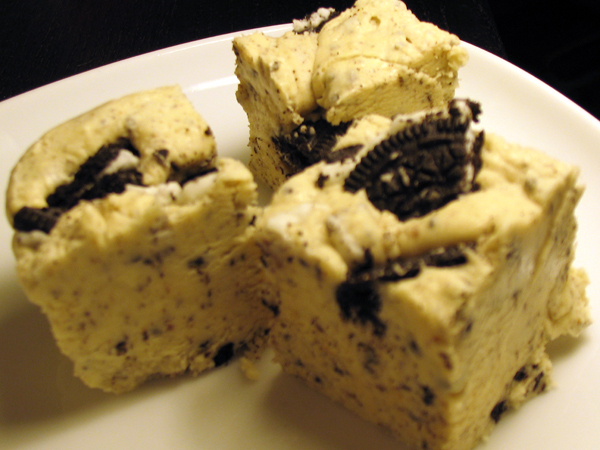 Sprinkle chopped Oreos on the top, and use a butter knife to lightly swirl the cookie pieces into the fudge. 6. Chill at least 1 hour before slicing.